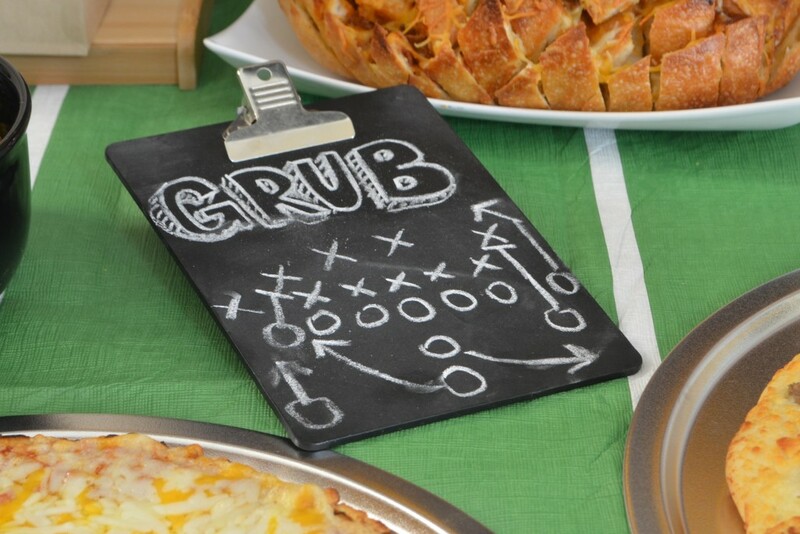 Game day is all about flavorful food, that’s simple to pull together, and easy to take with you so you don’t miss any of the action. 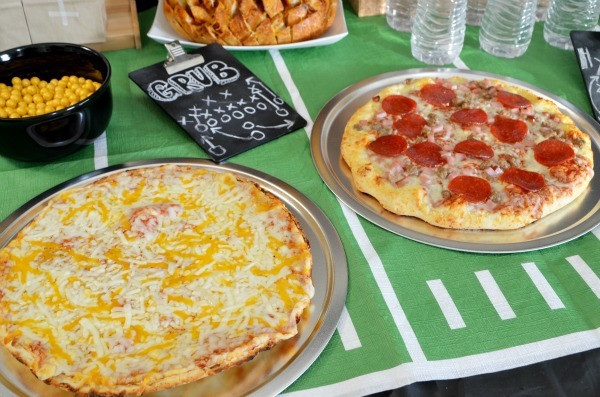 Pizza is the ultimate game day food, and it becomes the centerpiece of a fantastic home-gating tablescape with a few side dishes and decor pieces. 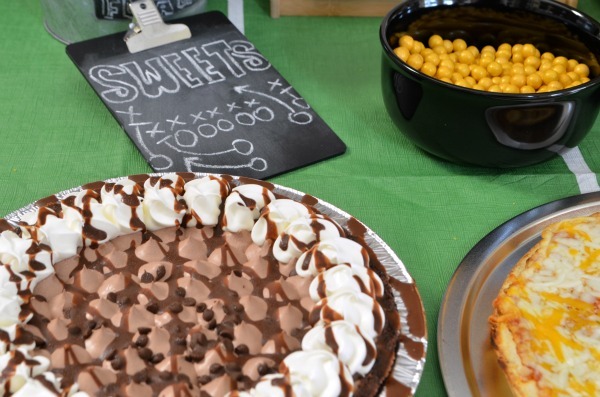 This past weekend we hosted a little family get together while enjoying the playoff games. I won’t name any names, but lets just say my husband was very happy with the outcome of one of Saturday’s games. We celebrated the win with one of my favorites from childhood, Red Baron frozen pizza. The centerpiece of our pie party, Red Baron Classic Crust 4-Cheese (my favorite) and Red Baron Brick Oven Meat Trio plus an Edwards frozen pie. 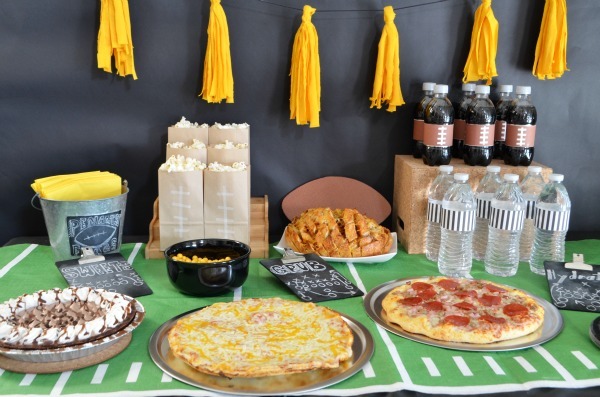 They make hosting a football party convenient and easy to pull together. Along with the perfect pie combo I served up chili cheese pull apart bread, veggies and homemade greek yogurt ranch for dipping. Because pizza just isn’t pizza in our house without ranch. Don’t worry I’ll be sharing this guilt free recipe later on. 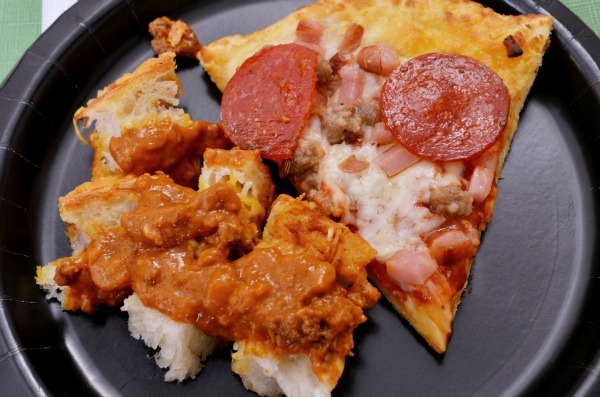 The pull apart bread and pizza tasted delicious dunked in it. We ditched the cups and stuck with bottled drinks at this party. Who doesn’t love to hydrate with water or fizzy drinks dressed up. 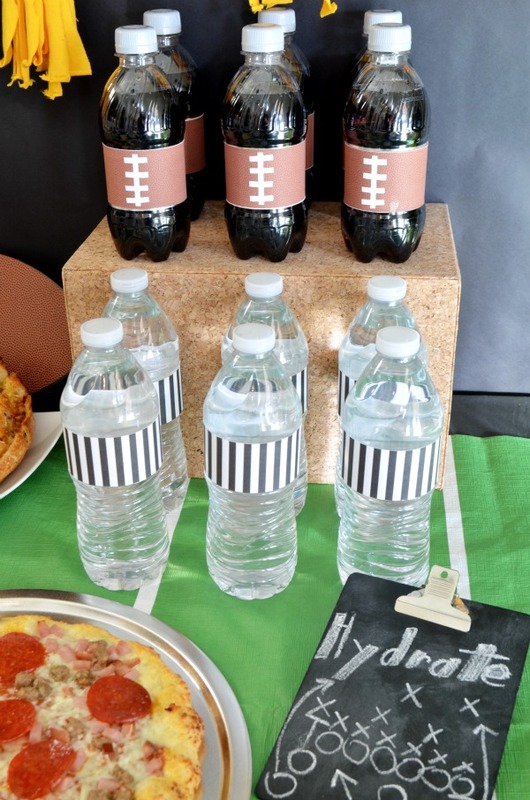 The football bottle wrappers are a printable I created last year and the water bottle ref shirts are just black and white scrapbook paper cut to size. I used one of the labels to make sure I cut it down to the right size, then secured with a piece of tape. Sticking with the theme of grab and go I kept the sweets simple with an Edwards Créme Pie and gold chocolates to match the rest of the decor. 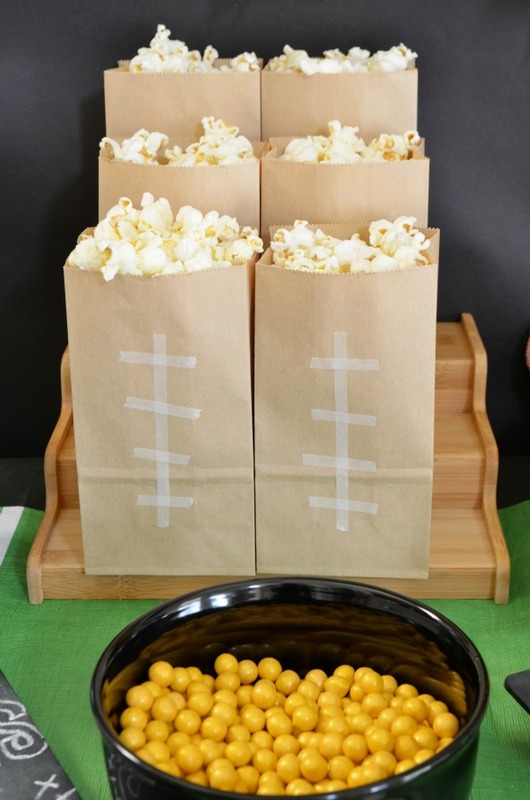 Throw in some air popped popcorn in cute little brown paper football bags for a snack later in the game after dinner. My oldest helped me put those together with just a little bit of thin white washi tape. Next up is decor. As game day comes every weekend from September to February, I like using items that can be easily reused to set the table. As this is the golden anniversary, marking 50 years of the “Big Game” I used that as my color inspiration. The great thing with these basic colors and a little turf green is adding your team colors is super easy. My talented husband helped make my chalkboard dreams come true. 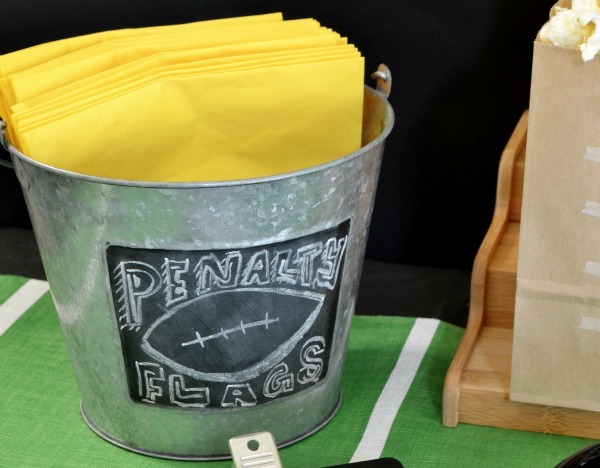 You should have seen how this penalty flag tin looked before he got his artistic hand on it. 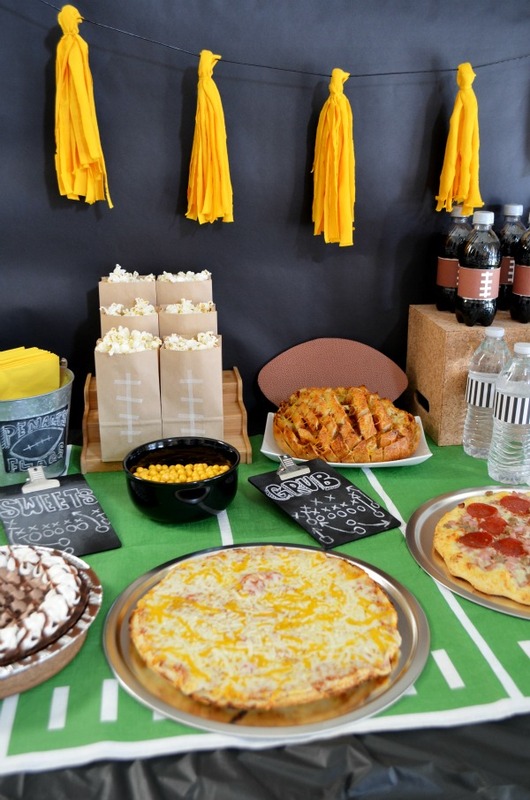 Yellow napkins brought in more of the golden anniversary hues along with a golden rod t-shirt tassel garland. I had him add a few plays to a few mini chalkboard clipboards too. 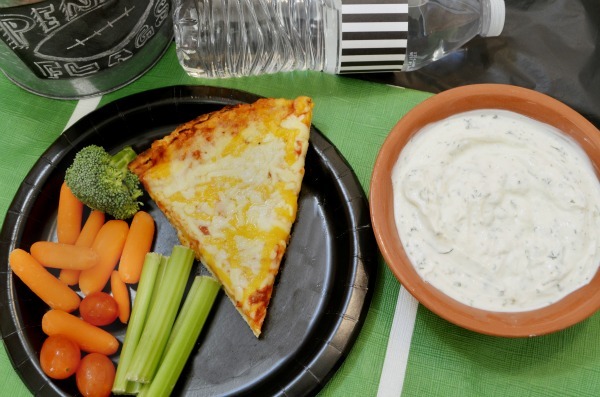 Time for that guilt free ranch dip with a super yummy ingredient, greek yogurt. This gives the ranch a thicker texture making it perfect for dipping. Place 1 c. greek yogurt in a small serving bowl. Place dip in the refrigerate to chill. Save leftovers in a resealable container. Add up to ⅓ c. buttermilk for dressing. Slowly add buttermilk until you reach preferred consistency. 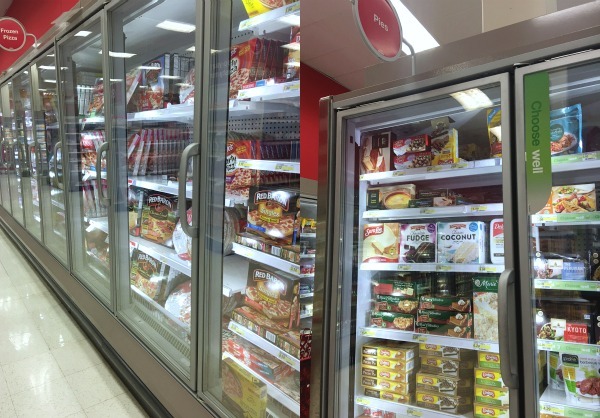 Everything I needed for game day I picked up at Target in the frozen food aisles. With brands like Red Baron and Edwards I can save time without sacrificing good food. All the flavor without any of the work, so I could focus on the simple football party decor. 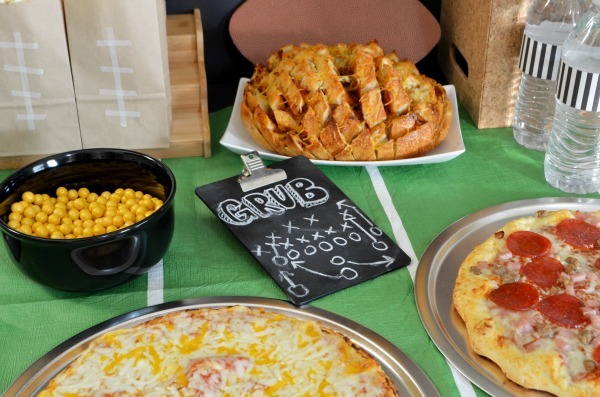 Right now you can save on game day essentials at Target with a Cartwheel for 5% off Red Baron frozen pizzas. So tell me is your house game day central? 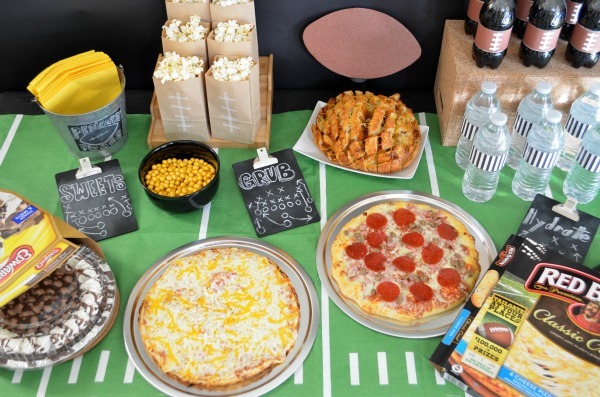 What foods are your MVP’s for the Big Game? Yum! Everything sounds great and such cute table decor! Love it!